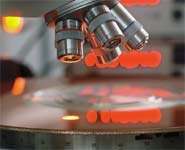 (PhysOrg.com) -- Scientists have shown in the laboratory that metal nanoparticles damaged the DNA in cells on the other side of a cellular barrier. The research, by the University of Bristol, is published online this week in Nature Nanotechnology. Scientists have shown in the laboratory that metal nanoparticles damaged the DNA in cells on the other side of a cellular barrier. The nanoparticles did not cause the damage by passing through the barrier, but generated signalling molecules within the barrier cells that were then transmitted to cause damage in cells the other side of the barrier. The research was carried out by a team at the University of Bristol and colleagues, and is published online this week in Nature Nanotechnology. The team grew a layer of human cells (about 3 cells in thickness) in the lab. They then used this barrier to examine the indirect effects of cobalt-chromium nanoparticles on cells that were lying behind this barrier. The amount of DNA damage seen in the cells behind the protective barrier was similar to the DNA damage caused by direct exposure of the cells to the nanoparticles. These findings suggest that the indirect, as well as the direct, effects of nanoparticles on cells might be important when evaluating their safety. More information: Nanoparticles can cause DNA damage across a cellular barrier, by Gevdeep Bhabra, Aman Sood, Brenton Fisher, Laura Cartwright, Margaret Saunders, William Howard Evans, Annmarie Surprenant, Gloria Lopez-Castejon, Stephen Mann, Sean A. Davis, Lauren A. Hails, Eileen Ingham, Paul Verkade, Jon Lane, Kate Heesom, Roger Newson and Charles Patrick Case. Nature Nanotechnology advance online publication on 5 November 2009. It is obvious that these kind of things would happen.